Figure 1. Gammarus locusta, photo by Francisco O. Borges (2017). These findings are described in the article entitled Hypercapnia-induced disruption of long-distance mate-detection and reduction of energy expenditure in a coastal keystone crustacean, recently published in the journal Physiology & Behavior (Physiology & Behavior 195 (2018) 69-75). This work was conducted by Francisco O. Borges, Eduardo Sampaio, Cátia Figueiredo, Rui Rosa, and Tiago F. Grilo from the MARE – Marine and Environmental Sciences Centre, Universidade de Lisboa. Climate change is a persistent subject nowadays, both at the scientific and political dinner tables. Indeed, since the beginning of the industrial revolution, the continuous injection of carbon dioxide (CO2) into the atmosphere, as a by-product of humanity’s activities, has been disrupting climatic systems around the globe. Of the vast array of potentially negative effects, ocean acidification poses one of the emergent risks to marine life, on par with ocean warming and hypoxia (i.e. the reduction of seawater oxygen levels). With rising concentrations of this greenhouse gas in the atmosphere, chemistry dictates that the dissolution of carbon dioxide into surface seawater will also increase. It is this global rise in oceanic carbon dioxide concentrations which creates the phenomenon of ocean acidification by effectively increasing the acidity of seawater (disrupting organism’s acid-base balances) and reducing the availability of certain elements which are necessary for the build-up of calcium carbonate structures (e.g. the shells in bivalves and the exoskeletons of crustaceans). Some of the main effects of this phenomenon to marine biodiversity can affect survival, growth, reproduction, and behavior, as has been demonstrated by numerous studies across taxa. Indeed, a high concentration of carbon dioxide can induce severe negative effects both on the physiological (e.g. metabolism) and neurologic (e.g. sensory systems) levels. Regarding physiology, many organisms have exhibited a reduction in energy stores (i.e. the energy an individual has available to ensure its biological processes) and decrease in metabolic rates (also known as metabolic depression) when exposed to increased CO2. The latter constitutes a condition considered to be a time-limited adaptation, in which an organism will reduce the energy requirements for the regulation of the acid-base balance, consequently reducing oxygen consumption, as a strategy to enhance survival under physiologically unfavorable conditions – although for a limited amount of time. Then, there are the potential effects on the neurologic level, which could affect chemosensory reception (i.e. the use of chemical information from the environment). Chemosensory reception is of extreme importance to marine organisms, in particular to crustaceans who depend on olfactory-mediated behaviors for a wide variety of processes (e.g. from feeding to habitat selection, mate-tracking, as well as reproduction, etc.). The potential hindering or impairing of this sensory system, either through the damaging of cues or impeding the correct reception and or processing in the receivers, could eventually lead to serious ecological effects. Surprisingly, there is relatively scarce information concerning the potential effects of climate change variables on this subject, particularly on what concerns the detection of sexual cues in crustaceans, and thus, this presented a rather interesting research subject. 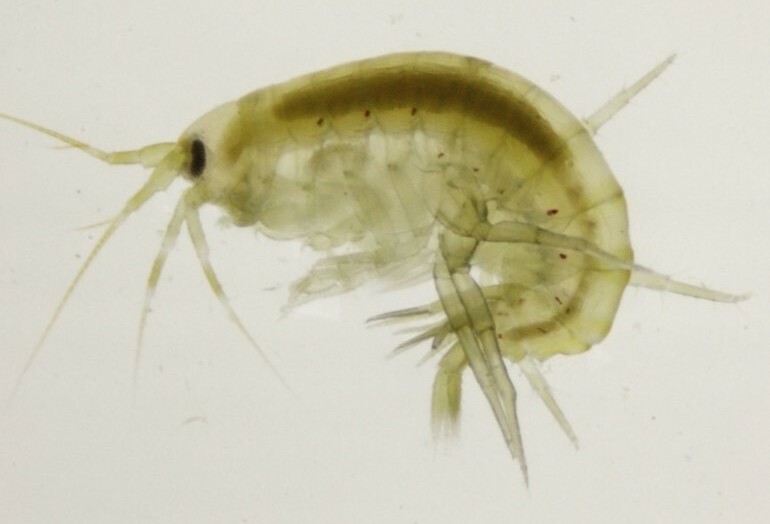 The marine amphipod Gammarus locusta (Figure 1) is a widespread crustacean with key ecological importance for marine and estuarine food webs, being preyed upon a vast number of species: from seabirds to fish and other crustaceans; and actively preying on a wide variety of other organisms, such as algae and smaller invertebrates. In gammarid amphipods, the attraction of sexual mates is elicited on two levels: through long-distance pheromones, which elicit the search for a female in males; and through body-contact pheromones present in the female’s exoskeleton, which allow the recognition of a receptive female by the male, and elicits initiation of a specific pre-copula behaviour (precopulatory mate-guarding – which consists in the guarding and carrying of the female by the male until they can mate). These pheromones are detected by the male’s aesthetascs (antennae-like structures), allowing a male to be aware not only a female’s current location but also gather information on her internal processes. Facing the current scenario of worldwide environmental change, we wondered what could be the potential effects of projected end-century acidification to the reproductive behavior of G. locusta males, as well as to the metabolic rates of both males and females. With this in mind, we exposed two generations of this species to a control and acidification scenario, adjusting carbon dioxide concentrations to current (~400 µatm) and projected end-century (~900 µatm) levels. When the last generation reached sexual maturity (which in this species and at 18ºC occurs at approximately 30 days of age), a sampling of the behavioral and metabolic traits was performed. A complete description of the methodology employed for the behavioral and metabolic sampling is available in our paper, for those interested in further details. However, here follows a brief description of the methods we used. 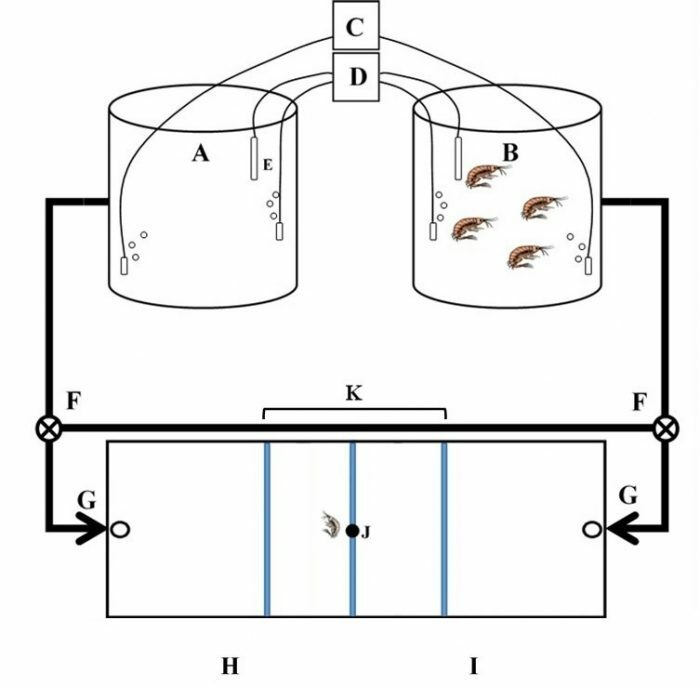 In order to measure the impacts on the reproductive behavior of males (specifically on the detection of long-distance female cues), a group of males was chosen at random and tested individually in a binary-choice experimental device (Figure 2). This setup consisted of a rectangular arena in which one male amphipod at a time was allowed free movement between two opposing water flows for 10 minutes (one containing female scent cues, and the other filtered seawater), after being previously exposed to both flows in a container for 10 minutes. This previous conditioning to both stimuli ensured that the animal was exposed to the cue before being released into the arena. During the free-movement phase, we recorded each male’s response latency (i.e. the amount of time required to initiate exploration of the arena), the first choice of direction (i.e. which water flow did the male go to first) and the proportion of time spent in each flow. To quantify effects on the amphipod’s metabolic rates, adult males and females were chosen at random and introduced individually inside a sealed acrylic chamber of a static, flow-through respirometry system suited with O2 sensor spots and continuous recording of O2 consumption rates inside the chamber. Afterward, these were used to calculate the routine metabolic rates, which are ecologically-relevant measures of metabolism. Our results were fairly interesting. There were significant effects of ocean acidification regarding the response latency and proportion of time spent in each water flow (specifically, increased latency in males exposed to the acidification scenario, together with a decrease in the time spent in the water flow containing the female cues) but none regarding the first choice of direction (in which they exhibited similar responses as the males from control). These results suggest CO2-linked behavioral disruption, possibly through the disruption of neurologic pathways and consequently the inhibition of the correct acquisition and processing of chemical information (although this was not evaluated in this study). Also, individuals exposed to the high CO2 scenario (both males and females) exhibited a significant decrease in their metabolic rate, which is indicative of potential metabolic depression, as described above. This condition has also been linked to an anesthesia-like state of activity in marine invertebrates, which can explain the greater amount of time taken to initiate movement. In summary, this study revealed that increased concentrations of seawater CO2 could potentially disrupt the sexual behaviors that depend on chemosensory information in gammarid amphipods, whether through the impairing of sensory systems, the hampering of metabolism or a combination of these factors. Not only this, but it also raises doubts regarding the amphipod’s ability to correctly process information related to predators, conspecifics, food, etc., under these highly stressful conditions. It is, however, worth to consider two things: first, that in the ocean system, ocean acidification is occurring at the same time as hypoxia and ocean warming, and that these effects could change (either worsen or be alleviated) by a combination of these factors. Second, one must also consider the possibility of long-term adaptation to stressful conditions that could eventually lead to a reduction in the sensibility of a population or species to a certain factor in the long run. What this means, is that it is important to pursue studies like the one above, but combining new factors and, if possible, evaluating the possible multigenerational responses, which could differ from a short term exposure. Nonetheless, there is now a growing amount of literature concerning the effects of projected climate change for marine species across taxa. It is of the utmost importance to continue investing in this type of research if we are to correctly advise politicians and policymakers and implement effective conservation measures in the near future. Francisco O. Borges, Eduardo Sampaio, Cátia Figueiredo, Rui Rosa, Tiago F. Grilo, Hypercapnia-induced disruption of long-distance mate-detection and reduction of energy expenditure in a coastal keystone crustacean, Physiology & Behavior, Volume 195, 2018, Pages 69-75, ISSN 0031-9384, https://doi.org/10.1016/j.physbeh.2018.07.023. Francisco is a research assistant at the University of Lisbon, MARE-Marine and Environmental Sciences Centre. Eduardo Sampaio is undertaking a multi-institutional PhD on cephalopod behavior, cognition, and neuroscience. He has a long-standing interest in cephalopods, due to their incredible behavioral repertoire, camouflage capabilities and complex cognition. 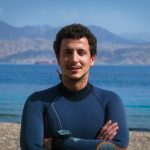 As a current National Geographic Early Career Explorer, he’s studying inter-specific cooperative hunting events between octopus and fish in the Red Sea. Sampaio is analyzing cross-species signaling, collective movement and group leadership, to describe whole-group dynamics of interspecific collaborative hunting. Concurrently, he is measuring how social information available during collective movement changes octopus decision-making, and how he adapts to cooperation (for example, by enforcing social rules) under multi-partner scenarios, to understand the capacities of this animal for social cognition. Sampaio’s drive is to increase our understanding on how these mysterious beings perceive and interact with the world around them. He hopes to shed light into key biological questions, such as: the extent and mechanisms of convergent evolution, and the rise of cognition throughout the phylogenetic tree of life. Catia is a research scientist at the University of Lisbon, MARE-Marine and Environmental Sciences Centre. Rui Rosa graduated in Marine Biology by FCUL in 1999 and completed a PhD degree in Biology by the same institution in 2005. Subsequently, Rosa carried out his post-doctoral activities on Ecophysiology and Climate Change at Univ. Rhode Island (USA), funded by FCT and Fundação Calouste Gulbenkian. Rosa received the two most important Portuguese scientific awards in the field of Marine Biology and others from international Societies (e.g. JEB Awards 2005, 2006). He is currently the elected Head of the “Global Environmental Change Line” in MARE Center. His research aims to understand the impact of climate change in the marine biota, from cells to ecosystems, towards a multidisciplinary and holistic approach. Rosa’s team is examining the combined effects of climate change-related stressors (ocean warming, acidification and hypoxia) on ecologically-relevant marine invertebrate and vertebrate groups. The multidisciplinary expertise of the group encompasses several research areas, at different levels of biological organization, including Embryology, Transcriptomics, Physiology, Ecology, Evolution, Toxicology, Modelling and Education. Tiago is a research scientist at the University of Lisbon, MARE-Centro de Ciencias do Mar e do ambiente.